← To Publish or not to Publish? Is that really the question? For two years The Reverend had hounded Jon to visit his mother. Jon was three years clean now, and a lifetime-in-hell older. He didn’t blame his old lady for kicking him out; she’d have ended up in hospital otherwise. Now, in his old street, the corner store was boarded up and the newsagent’s was a strip joint. His mother’s proud marble steps reeked of urine. His fingers shook as he searched through the papers stuck under the door: Kmart brochures, a flyer for graffiti removal, a gas bill addressed to a stranger. Funny thing, though. This place finally felt like home. This entry was posted in Short stories, Uncategorized and tagged flash fiction, Friday Fictioneers, short stories, very short stories. Bookmark the permalink. I like the contrast you use between the way Jon’s life has improved and how his mother’s neighbourhood has deteriorated. Somehow the situation arrives at a happy medium making your last line speak volumes. Very clever. He had never felt really at home in the place he grew up. But you’re right, he does now. Thanks for your insightful comment, Mike. Thanks for your kind comments, kz. I thought Mike nailed it pretty good with his comments and I loved the last line. Well done. This is a great slice of life, and like your other commenters , I loved the last line. I appreciate you taking the time to read and comment, Jan. Thanks. That’s a very thoughtful piece – enjoyed it. I’m glad you enjoyed it, Sandra. Thanks for visiting. Quite a novel approach to the prompt – almost like a novel in 100 words. Good job. And you are the first to mention the marble steps – and how the neighbourhood had fallen so low. It did cover quite a bit of ground for a flash story. Thanks so much for reading and commenting, Linda. A story after my own heart. In 100 words you’ve taken me to a deeper place. There’s a lot more to read between the lines. Good job. Thanks, Joanna. 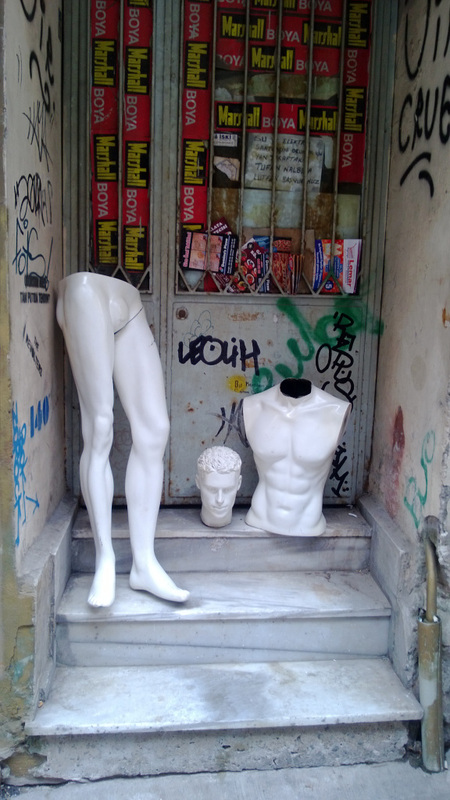 The marble steps seemed every bit as incongruous in the photo as the dummy. Hate to ask, but is the reason it now feels like home because it’s like the doorway he regularly sleeps in when the heat register’s already occupied? Good story. I’m pleased you asked. I don’t know what a heat register is but I tried to suggest he didn’t ever feel he fit into the home he grew up in – corner stores, newsagents, marble steps (his mother’s middle class aspirations). The deterioration of this neighbourhood paralleled his own fall into drugs and homelessness so now he feels they are a better fit. I did feel I needed more than 100 words to get it all in. I really appreciate your comment. Thank you. This is marvelous.. like in any good story.. all that has really happened is never told. But enough hints for the reader to add those huge missing pieces. This is my favortite type of stories.. Thanks very much for your comment, Bjorn. You’ve made my day. Definitely amongst the best this week. That’s a real compliment, Etienne. Thank you. The division between Jon’s progress and the neighborhood’s decline is haunting. Raw. “Jon was three years clean now, and a lifetime-in-hell older.” Love that line, and this: “His mother’s proud marble steps reeked of urine.” Really fine writing, Karen. Thanks very much for taking the time to give such detailed feedback, Dawn. I appreciate it. Reading the other stories is half the fun! Love to see what each person does with these.